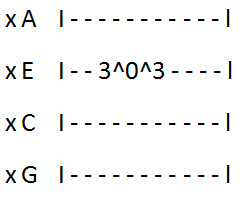 Ukulele tablature consists of 4 horizontal broken lines with numbers and letters on different lines. 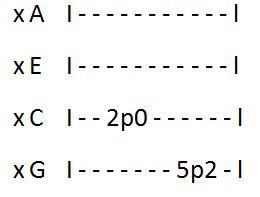 The first example below shows a basic template of tablature and the second shows an advanced tablature for a specific song or melody. 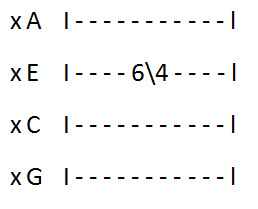 Playing chords in tablature usually has a number on each line which are played all together with a strum. The zeroes stand for no fret. 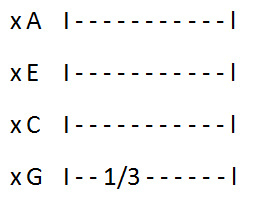 For example, the following notes are portrayed in the tablature below: F G A C D Am. A hammer - on (shown as a 'h' in tablature) means when you pluck one string but 'hammer - on' or press another note. For example, you pluck the C string then 'hammer-on' the second fret. A pull - off is the opposite of a hammer - on. However, instead of pressing another string, you pull your finger off. For example, you pluck the C string on the second fret then 'pull - off' to an open string or you pluck the G string on the fifth fret then 'pull - off' to the second fret. When you put a 'hammer - on' and a 'pull - off' together, it becomes an alternative hammer - on/pull - off, also known as '^.' In the example below, you see '3^0^3' which means that you pluck the E string on the third fret pull - off to an open string then hammer - on on the third fret again. Sliding basically means plucking one string and sliding up or down to another fret. The sliding up symbol is / while the sliding down symbol is \. In the first example below, you pluck the G string on the first fret then slide up to the third fret while in the second example, you pluck the E string on the sixth fret and slide down to the fourth fret.